I get CD's thrown on my desk quite often, and almost all of them have band names that are new to me. I always give each disc a fair shake in respect of the efforts that each band has put forth. But as you might imagine, much of the music that these discs give out is forgotten just hours, if not minutes, after I hear it. Some stuff sounds good and some of it bad, but every once in a while I get something that makes the world stop turning. "Beneath the Veil of Winter's Face" is one of those discs that has taken over my life. The Unicorn Digital record label (www.unicorndigital.com) was founded in 1995 by Michel St-Pere as a vehicle to promote and release the music of his band, Mystery. The primarily progressive rock label has since been an outlet for many wonderfully talented acts such as Dimension X, Kopecky, Hamadryad, and guitarist Daryl Stuermer. You'll find St-Pere handling guitar, bass and keyboard duties as well as taking on the production responsibilities. And as if that wasn't enough, he wrote all of the music and lyrics (with the exception of one track) as well. After listening to this spectacular set you'll realize that those credits are all quite impressive too. Not only are all of these tracks incredibly well written and performed, they are superbly produced also. 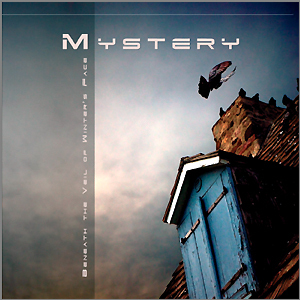 The music of Mystery is progressive, yes, but with a classic rock attitude that spews with the spirit of early Genesis or Yes and the hooks and vocal clarity of bands like Styx or Rush. Besides the immense talent of St-Pere, this band has one of the best singers of the genre in Benoit David. The crystal clear high tenor is a real breath of life on this record. Much like Boston's Brad Delp or Yes's Jon Anderson gave a bright and inviting sound to the music of their bands, David brings all of these great melodies to life. It's the kind of voice that never gets tiring; in fact, you can never get enough of it. Hearing him bellow on the poignant ballad "The Sailor and the Mermaid," or listening to his cheerful sway on the opening track ("As I Am"), I find my spine tingling from time to time. The thing I find most appealing about the songs here is the bright, energetic feeling that they have. Even the more subdued melodies seem to have a positive cheerfulness to them. For example, the title track has a choir type of chant with a deeper, more epic feel to it, but the tight production and the clarity of David's vocals make the song a triumphant ray of light. There are so many examples of this kind of energy that I cannot possibly tell you of all of them, but let me point out some of my favorites. The amazing production levels of "Snowhite" are something that every music fan should be treated to. The two different levels of vocals and the bright smashing keyboard sound are amazing. This is the perfect song. Another intricate part of this record is the many facets of St-Pere's guitar playing. Besides simply playing his parts, he provides an atmosphere for many of these songs too. "Voyage to the Other Side" is a song that best exemplifies this kind of subtle guitar playing that is so important to this record. The swirling streaks of sound that are layered beneath the soaring wail of the traditional guitar part make this song something extra special. He also shows many styles of playing on the record as well. Be it the rocking chords of "The Preacher's Fall" or the David Gilmour tone at the beginning of "Snowhite," you get the feeling that there isn't much that St-Pere can't do. If this doesn't end up as my Album of the Year, I will be shocked. Musical artistry doesn't get too much better than this.